to arrange a no obligation quote. 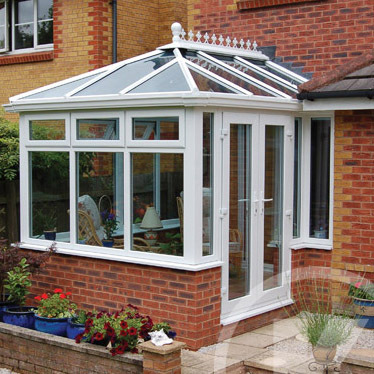 The Victorian is one of the most popular conservatory styles. These conservatories are generally adorned with the traditional cresting and nials. They are versatile both in terms of size and practicality. They will complement almost any style of property and can be readily adapted to suit whatever space is available – whether a large garden or a small patio area. Typically Victorian conservatories have a three or ve facet bay. A touch of modern splendour. This increasingly popular design enjoys an imposing front elevation, delivering a feeling of height and space. As a result, the Gable adds a real sense of presence to any home – even older, period properties. If you’re looking for a conservatory that takes your breath away every time you look at it, then this is definitely the style for you! A union of space and style. The Georgian conservatory, also known as the Edwardian, is characterised by its square or rectangular footprint. This means they are incredibly space ef cient – allowing you to achieve the maximum possible oor area, with increased furnishing options. The Georgian conservatory isn’t just about function. It is a stylish choice that will suit many contemporary homes with its clear, strong lines. Often at its best with a brick dwarf wall. Maybe you’re looking for something a little less ornate. Perhaps you live in a bungalow or a house with low eaves. 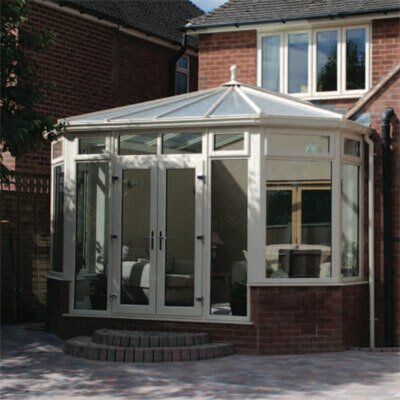 Either way, a Sunroom or low pitch conservatory equates to the perfect design solution. Sometimes referred to as a Mediterranean, Lean-to or Studio room, this style enjoys crisp, clean lines and has a truly modern feel. Considering the aesthetic appeal, quality and impressive levels of versatility offered by a conservatory, you’ll probably be keen to create your new, prized investment! But, before you dive head first into the decision making process, it is always worth spending a few moments planning your new investment and thinking about any issues that might affect its construction and eventual use. The position – or aspect – of your conservatory should always influence your natural choice of design, layout and furnishings. Conservatories facing south receive more direct sunlight and as such you might want to consider additional ventilation, blinds and even the use of a performance glass such as Celsius. With north facing conservatories, these issues are less pressing. However, the use of glass as a glazing option to prevent heat loss and overheating is increasing in popularity whatever the location of a conservatory. East facing conservatories catch the early morning sun and make ideal morning or breakfast rooms, whereas west facing rooms catch the evening sunset and are a perfect place to relax after a long day. 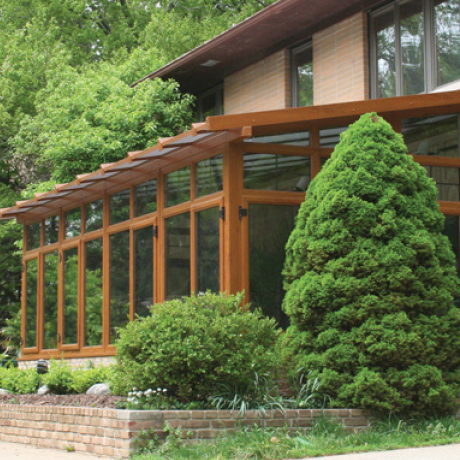 When it comes to conservatories, bigger isn’t always better. What really counts is that you opt for a size and shape that will complement your home and garden – not overpower them. Also don’t be content with a mental picture of your conservatory as plans and measurements on paper can be deceptive. Get a feel for the conservatory area, go outside and mark out the planned boundaries, then walk around within them to get an accurate impression of your conservatory’s dimensions. Remember that the walls will take up space so your conservatory’s interior will be smaller than the area marked. Planning & building regulation requirements can vary across the UK. For more information please visit www.planningportal.gov.uk In all cases, if you have any doubts at all, check with your local authority. Think about the type of glazing you’d like to use. Normal glass and polycarbonate will allow solar heat to penetrate into your conservatory, raising the inside temperature on hot summer days. To avoid this, whilst reducing heat loss in winter, opt for Celsius performance glass. 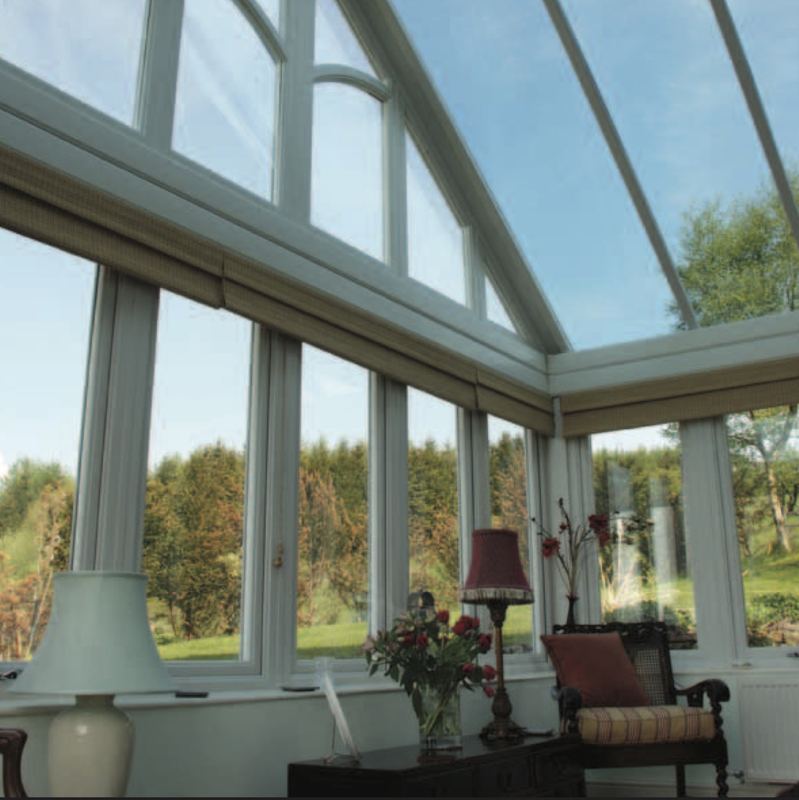 Ensure that you have adequate ventilation so that you can enjoy your conservatory even on the warmest of days. The K2 roof vent lets fresh air in whilst keeping the elements out. You could also consider roof fans or an air conditioning unit.